Have a specific stain? You may be able to get it out yourself! 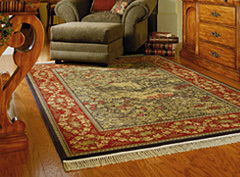 Spot Free Carpet Cleaning has been built on 100% referrals. If you have a good experience with us our hope is that you will recommend us to your family, friends, and neighbors. Unconditional Satisfaction Guarantee: How could you refer us to your friends in good faith if you didn't know that we would offer the strongest guarantee in the industry? You couldn't, so that is why out guarantee is on our service receipts. Our guarantee is that if the customer is not completely satisfied with our service, we will return promptly (notice I said promptly) and remedy the situation. If the client is still not happy, we will return the payment for services without and questions. 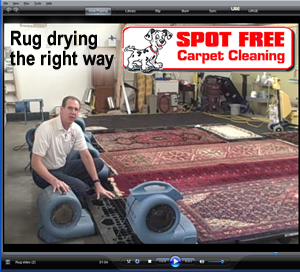 Mike Hammersley, owner of Spot Free Carpet Cleaning, explains how Spotfree uses the proper method of drying your rugs. Click here to view video, or click on the image below. Copyright © 2002 Spot Free Carpet Cleaning. All Rights Reserved.